We left early, before anyone else at the chateau was stirring. Although the setting was beautiful and the building very interesting, we were disappointed with our stay at Chateau de Grezan. 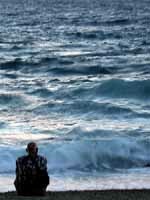 The lack of security, the all-night noise, a strangely complicated lock on the front door, no early breakfast, and Madame's seeming disinterest in her guests: all made this the first regrettable choice of the many places we have stayed. The Chateau de Pintray in the Loire region and Chateau de Roussan near St Remy de Provence, both family-operated, were far more gracious and solicitous to their guests. We drove through Beziers (I think we were finally beginning to understand the streets) and took the highway south past Narbonne and on to Perpignan. 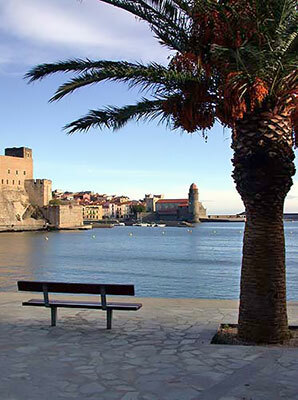 Our original plan had been to stay two days in Collioure and then drive all the way to Marseille, but we soon realized that would be a very long trip on an uninteresting highway. So we decided to drive only as far as Perpignan, drop off the car, and then take the train to Marseille. We drove into Perpignan, scouted the Hertz location, bought our rail tickets for Monday, and tried to get back on the highway. As in Beziers, we got into a circular route outside the old citadel walls and couldn't find the road to the main highway south. Instead we ended up east of the main highway on local roads, but at least were near the coast of Roussillon, the region south of Languedoc. We headed south and passed many expensive tourist resorts which had been built on the sandy coastline. 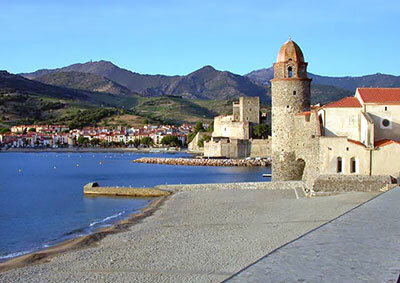 We arrived at Collioure in the early afternoon and checked into our hotel, Le Bon Port. We had asked for a room with a "sea view" but found a huge tree outside the window. The concierge explained that the sea was on the other side of the tree. Aaah. Yes. 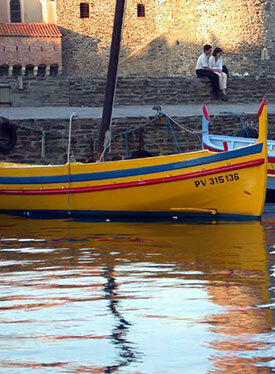 Collioure is a fishing village, somewhat commercialized but still quite attractive. Matisse "discovered" the town in 1905 and, attracted by the light, the sun and the blue of the sky and sea, persuaded other painters to join him. 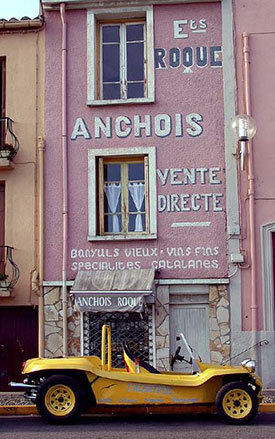 It soon became an artists' mecca, attracting Derain, Dufy, Dali and Picasso. The harbor is full of "working" fishing boats, as well as the four brightly colored ones that seem to remain anchored for the benefit of tourists and tour-guide photographers. There are beaches which seemed quite popular during our stay. The town was not too crowded, although it is said the months of July and August bring hoards of visitors and long lines of traffic. After a delicious lunch at Le Saint Elme, a beachside seafood restaurant (moules for Al, salmon for me), I headed back to the hotel to rest while Al wandered about with his camera. He returned with wine, bread, cheese and eclairs. Very sensible. 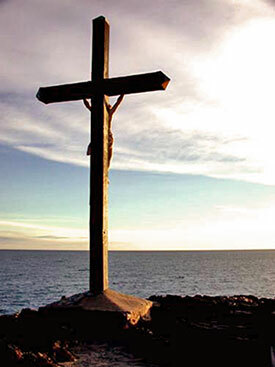 We soon set out to explore the Chateau Royal, built by the Knights	Templar in the 13th century; the Eglise Notre-Dame-des-Anges (Church of Our Lady of the Angels), which was built in the 17th century; and the outer fortifications of the old city. 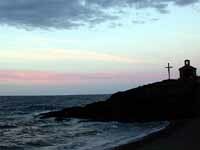 The sea and the old stone lighthouse tower are especially striking in the late afternoon light or at sunrise. We noticed a poster on a wall advertising a concert at the Chateau Royal that night so, after a pizza dinner, we went to the concert. The concert, part of a summer series featuring classical artists from many parts of France, took place in a courtyard within the chateau. Tonight's performers were the "Trio Architecture et Music de Paris" which consisted of an oboe, clarinet and bassoon playing Beethoven and Mozart. The third work was a world premier of a work by a young lady named Analit Simonian called "L'Introuvable", dedicated to the Chateau Royal itself. A cello joined the group to perform the new work. They were also accompanied by Mother Nature, in the guise of a strong wind. Clothes pins were used to secure the music to the music stands, but to no avail. Sheet music blew across the stage. Then one of the lights used to illuminate the music for the musicians went out. A music stand slipped spread-eagled to the floor. Was Victor Borge in the wings? The audience tried hard to stifle laughs, and the musicians took it all good-naturedly. This was a highly accomplished group. However, we were cold and tired, and the chairs were uncomfortable, so we left at intermission. And learned the next morning that we missed a complimentary wine tasting after the performance. Darn. Al was out early to take photos. At petit dejeuner ( breakfast) I recognized the cellist from last night's concert. For the first time ever, without Al around to bail me out, I initiated a conversation with a Frenchman who knew no English; and it went fairly well, if I do say so myself. I told him I had been at the concert and enjoyed it very much. He thanked me and told me he was the father of the composer of the new work. He seemed complimented that I would recognize and congratulate him. Our conversation was short, awkward and rather rudimentary but, boy, was I proud of myself. Maybe I'll get the hang of this language someday! We walked up the hill behind our hotel. 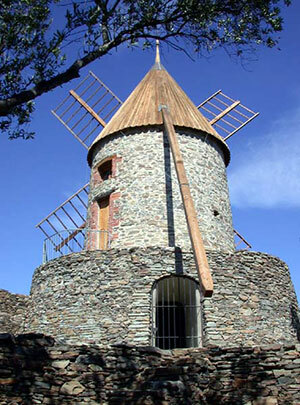 There was an old windmill and farther up, Fort St-Elme. This is one of the two forts that once guarded the port. 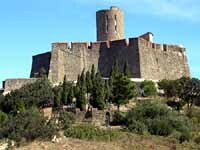 The other, Fort Miradou, lies north of town, too far for us to explore in our two days here. The trail up to Fort St-Elme was narrow, winding and sometimes steep; but we persevered and finally made it to the top, only to find it is now a private residence. Bummer. Rather than go back down the same way, we set out to see where the paved road on the other side of the hill would take us. 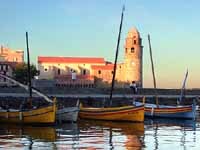 It wound its way toward Port Vendres, which is home to one of the most active fishing fleets on the Roussillon coast. 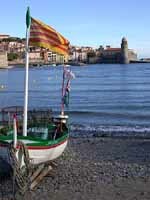 We didn't go into Port Vendres but instead walked back to Collioure along the cliffs above the sea.